Kick off your visit on the 8th (Fri): steep yourself in history at Tofuku-ji Temple, steep yourself in history at Fushimi Inari-taisha Shrine, and then make a trip to Kiyomizu-dera Temple. Get ready for a full day of sightseeing on the 9th (Sat): contemplate in the serene atmosphere at Kinkaku-ji, then contemplate in the serene atmosphere at Ryoanji Temple, then explore the historical opulence of Nijo-jo Castle, and finally steep yourself in history at Sanjusangendo Temple. For traveler tips, ratings, reviews, and more tourist information, you can read our Kyoto road trip website . Madison, USA to Kyoto is an approximately 21-hour combination of bus, flight, and train. You can also do a combination of bus and flight; or do a combination of flight and bus. Traveling from Madison to Kyoto, you'll lose 15 hours due to the time zone difference. Plan for somewhat warmer temperatures traveling from Madison in March, with highs in Kyoto at 57°F and lows at 40°F. Finish your sightseeing early on the 9th (Sat) to allow enough time to travel to Amagasaki. Amagasaki is an industrial city located in Hyōgo Prefecture, Japan. On the 10th (Sun), take some stellar pictures from Tempozan Ferris Wheel and then get in on the family fun at Universal Studios Japan. To find where to stay, reviews, ratings, and tourist information, go to the Amagasaki route app . You can drive from Kyoto to Amagasaki in 1.5 hours. In March, daytime highs in Amagasaki are 57°F, while nighttime lows are 40°F. Finish up your sightseeing early on the 10th (Sun) so you can travel to Motobu-cho. Formed by the gradual merging of several old fishing villages, today the island town of Motobu-cho boasts paradisal beaches of white sand, clear waters, and a rich array of wildlife. Start off your visit on the 11th (Mon): meet the residents at Okinawa Churaumi Aquarium, then admire nature's wide array of creatures at Okichan Theater, and then enjoy the sand and surf at Emerald Beach. Start your trip to Motobu-cho by creating a personalized itinerary on Inspirock. Use the Route module to find suitable travel options from Amagasaki to Motobu-cho. Prepare for somewhat warmer weather when traveling from Amagasaki in March: high temperatures in Motobu-cho hover around 70°F and lows are around 57°F. 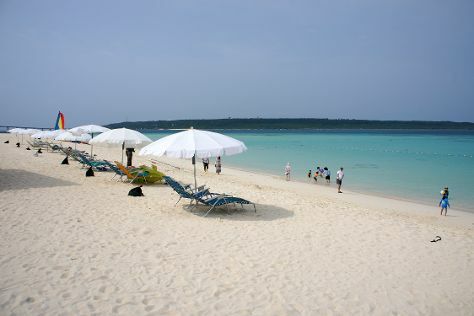 Finish your sightseeing early on the 11th (Mon) so you can travel to Taketomi-jima. On the 12th (Tue), explore the fascinating underground world of Ishigaki Island Limestone Cave, then stroll through Yonehara Beach, then steep yourself in history at Ishigaki Yaima Village, and finally enjoy the sand and surf at Kondoi Beach. Get ready for a full day of sightseeing on the next day: stroll through Banna Park, then get great views at Nagomi Tower, then take a leisurely stroll along Nishi Pier, and finally kick back and relax at Kaiji Beach. To find where to stay, more things to do, maps, and tourist information, go to the Taketomi-jima trip planner . Use the Route module to find suitable travel options from Motobu-cho to Taketomi-jima. Traveling from Motobu-cho in March, Taketomi-jima is a bit warmer at night with lows of 65°F. Cap off your sightseeing on the 13th (Wed) early enough to travel to Miyakojima. On the 14th (Thu), enjoy the sand and surf at Sunayama Beach, snap pictures at Irabu Bridge, then kick back and relax at Yonaha Maehama Beach, and finally take in the views from Kurima Bridge. On the 15th (Fri), you'll have a packed day of sightseeing: make a trip to East Henna Cape, kick back and relax at Aragusuku Beach, and then snap pictures at Ikema Ohashi Bridge. For traveler tips, photos, more things to do, and tourist information, refer to the Miyakojima driving holiday planner. Getting from Taketomi-jima to Miyakojima by combination of ferry and flight takes about 1.5 hours. 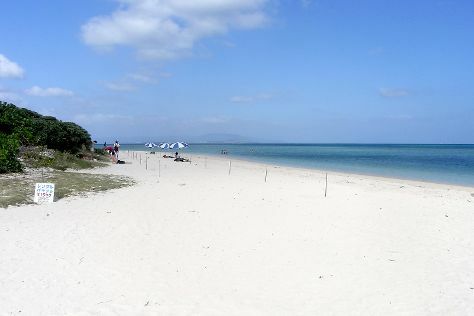 March in Miyakojima sees daily highs of 72°F and lows of 63°F at night. Finish your sightseeing early on the 15th (Fri) to allow enough time to travel to Tokyo. Bring the kids along to Shinjuku Gyoen National Garden and Tokyo Disneyland. Go for a jaunt from Tokyo to Urayasu to see Tokyo DisneySea about 30 minutes away. Next up on the itinerary: take some stellar pictures from Tokyo Metropolitan Government Buildings, make a trip to The Tsukiji Market, examine the collection at Edo-Tokyo Museum, and admire the striking features of Tokyo Tower. To find reviews, more things to do, photos, and other tourist information, you can read our Tokyo trip builder site . Traveling by flight from Miyakojima to Tokyo takes 5 hours. Traveling from Miyakojima in March, expect nights in Tokyo to be much colder, around 43°F, while days are slightly colder, around 58°F. Finish your sightseeing early on the 18th (Mon) to allow enough time to travel back home.